Have you always wanted to grow beautiful roses but can't find the extra garden space? Are there varieties you want to try that are not hardy to your zone? Do you wish you had greater ability to move color to where you need it throughout the growing season? Growing roses in containers can solve all of these gardening problems and more. Roses grow best in full sun (8-10 hours per day). Because heat (too much) and moisture (too little) can affect their ability to produce flowers, the size of the container you choose and the material it is made from require important considerations. Small pots hold less soil and dry out more quickly, thus will require more frequent watering and feeding. Unlined pots made from porous materials like clay dry out quickly. Dark colored pots and plastic pots may retain more heat. Large pots and ceramic pots are heavy to move without the aid of wheeled supports. Unless you want to grow miniature roses (which do fine in 10 to 12 inch pots), select a container that is at least 15 to 16 inches in size for florabundas and small hybrid teas, and containers 18 inches or more for large hybrid teas and tree roses. Whatever container you choose, it should drain freely. Soil: A good mixture for container roses contains equal parts commercial sterile potting soil, compost, and aged manure. Add in a cup or two of perlite to encourage good drainage. Because container roses require frequent watering, many gardeners find that mixing in a soil additive for moisture retention is also helpful. These are made up of small crystals that, when exposed to water, expand to form a gelatinous mass. As the soil dries the crystals shrink and slowly release moisture back into the soil. 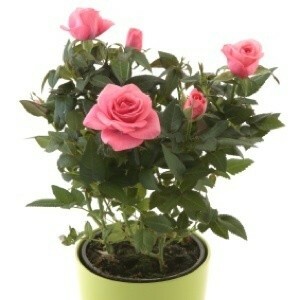 Planting: Plant your container roses at the same depth you normally would outdoors. For bareroot roses, place the graft union about 1 inch below the soil surface in cold climates and above the soil in warm regions. Roses transferred from pots should sit at the same height they were growing in their nursery containers. Containers should be filled with soil so that ultimately the plants end up 1-2 inches below the pot's edge. After about 3 years, container roses may become root bound and need re-potting to the next largest size pot. This is also a good time to inspect and trim the roots, and refresh the soil to eliminate the buildup of fertilizer salts. Watering: Moisture levels for container roses should be monitored closely. Like most container plants, they prefer a good soak to light, frequent waterings. Insert your index finger into the soil to test moisture levels. If the top 1-2 inches feel dry, water the roses until water drains freely out the bottom of the pot. In warm weather daily watering may be necessary. Fertilizing: Roses are heavy feeders. For healthy growth and beautiful blooms, feed roses a liquid organic rose fertilizer twice a month (granular once a month) throughout the growing season. Too much nitrogen will result in more foliage and less flowers, so it's best to use a fertilizer blend designed specifically for roses. Gardeners living in subzero zones need to protect their container roses over winter. Plants should be allow to go dormant, then moved to an unheated (frost-free) basement or garage where temperatures stay between 40 F and 50 F. Containers should be watered every 1-2 months to prevent them from completely drying out. Gardeners without access to an unheated basement or garage can protect their roses by dropping a tomato cage over the plants, wrapping the containers in an old blanket, filling it up with leaves or straw, and moving the containers to a sheltered area next to a building or underneath a porch. Save any maintenance pruning for spring so that plants have access to all available nutrients during the winter. Oh, my. If my friend Marcia read this she'd never have tried growing roses! She never fed them anything beyond tossing coffee grounds (sometimes filter and all!) and banana peels (not ground up nor nuthin') under the bushes. Me? I didn't even do the banana trip! Her watering wasn't totally consistent, either. And we never bothered to fuss with them or cover them in winter, even tho' we had lotsa snow every year. Marcia had the largest bushes and the most beautiful array of very plentiful blossoms; our neighbors marveled at her success every year. Oh, and she never was one to even think of pruning or cutting back. I tried to get her to do some, but she just let 'em grow "like weeds" (which reminds: she wouldn't fuss with the grounds around 'em either, weeds often grew up into the large bushes!). So don't panic if you don't think you have time and patience to grow roses. Just get some an' go for it. Good luck.